With seasoned development officers in high demand, universities and colleges are engaged in a battle with each other for proven fundraisers. Heavy competition for existing talent has led to inflated compensation packages yet shorter tenures for college and university fundraisers while doing little to increase the supply of talent. Download our original research and explore our findings. 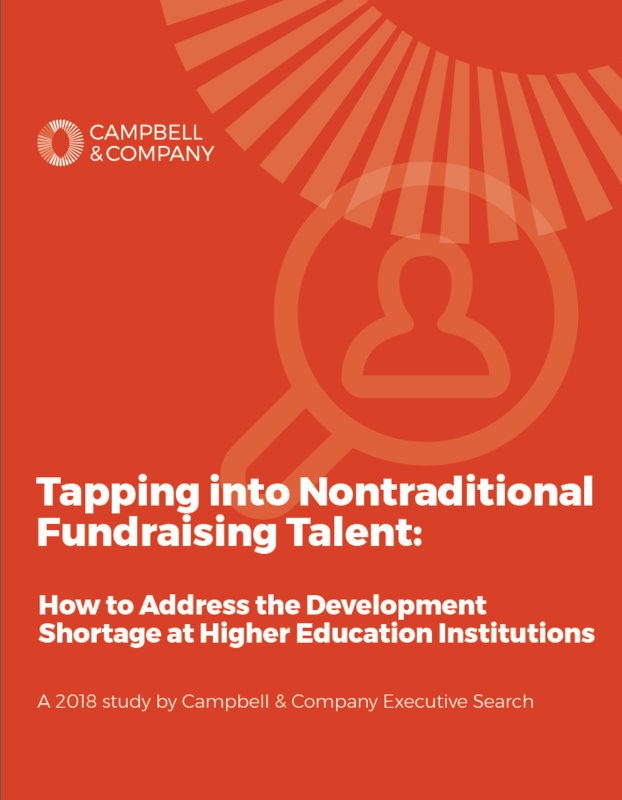 When the Campbell & Company Executive Search team set out to explore the state of advancement talent recruiting in higher education, we wanted to hear not only of the struggles but also of the successes. What is failing? What is working well? Where can we make improvements? Which approaches can be replicated industrywide? This study presents the results of our qualitative and quantitative research through an in-depth discussion of six key themes, supported by quotes from advancement leaders and survey results. The Campbell & Company Executive Search team is dedicated to helping nonprofits find standout leaders that grow and thrive in their positions over the long term. If you have questions about our study findings, please don't hesitate to contact me. Daniel Fissinger is a Consultant, Executive Search at Campbell & Company. He thoughtfully engages clients to understand the organization’s culture, identify their needs in senior leadership, and uncover high-potential candidates.